Are you a red coffee drinker or a blue coffee drinker? 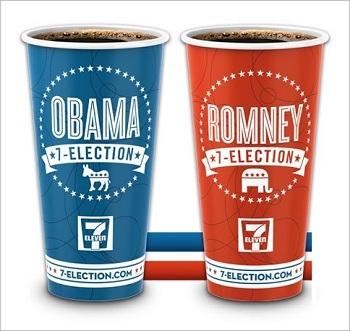 Since this is an election year, 7-Eleven hosted their own 7-Election (in partnership with The Onion) to try to predict the outcome of the national presidential race. Coffee drinkers voted by choosing to have their coffee in red or blue cups, and the stores kept track of how many cups of which color went out the door. Green cups were available for undecided drinkers, although there don’t seem to be stats available for that color. It’s not an official count, but Obama is definitely ahead in the coffee polls. And since we have a few more hours until election results start coming in, this is all we have to go on at the moment. If nothing else, we can tell that people who get their morning coffee at 7-Eleven prefer blue cups (and possibly Obama) to red cups.